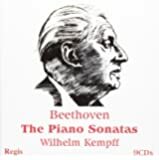 Having listened to several complete sets of Beethoven's piano sonatas and some incomplete sets as well, I have come to the conclusion that Wilhelm Kempff's mono studio recordings from the mid-1950s comprise my overall favorite. 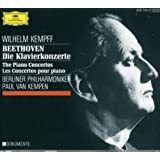 This has surprised me as much as anyone; Kempff's musical temperament doesn't match that of the stereotypical Beethoven - the moody, fiery virtuoso so apparent in the `Appassionata' sonata or the 5th symphony. 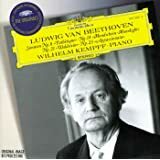 Yet as those of us who have explored his music in depth, there has always been more to Beethoven, whether it be his humor and charm in works such as Op. 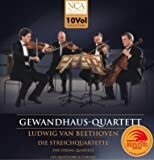 31/1 and the 8th symphony, or the searching, introspective way that revealed itself most completely in his late sonatas and quartets. 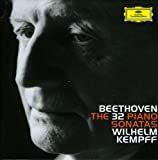 It is these lesser-acknowledged facets of Beethoven's musical personality that Kempff conveys so completely, and they are at the heart of the 32 sonatas. 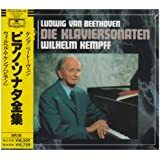 Kempff was not drawn to extreme tempos as are many Beethoven interpreters - his slow movements are often on the fast side and his fast movements are sometimes on the slow side. Yet he is able to give the music its meaning with attention to detail, thoughtful yet subtle phrasing, spontaneity, and a highly expressive tone. This last point is particularly commendable and is something that is perhaps undervalued among our contemporary virtuosi. 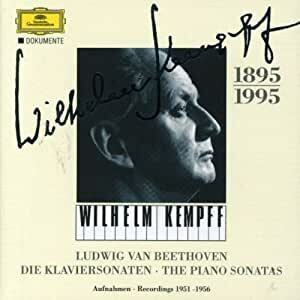 Kempff seems to mold his piano into several different instruments depending on the needs of the music, achieving a level of tonal variety that is seldom approached among other pianists. Kempff was at his greatest among the lesser-known sonatas. For me, Kempff's recordings of the Op. 10 and 31 trios, Op. 26, Op. 27(#1&2), Op. 28, Op. 78, Op. 79, Op. 81a, Op. 90, Op. 101, and Op. 111 are reference recordings. Others may share that reference status in some cases, but in my opinion none exceed Kempff in these works. On the other hand, one could complain about his approach to some of the more famous sonatas. 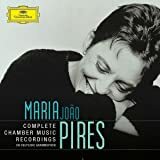 His `Pathetique' and `Appassionata' sonatas are rather tame by most standards, lacking the pacing and sheer energy to be considered entirely successful. The same could be said of a smattering of other fast movements throughout this collection. By the same token there are slow movements that sometimes don't seem to get the gravity they deserve, like the Andante of the `Pathetique', or even some of the more poetic portions of Op. 109 and 110. Overall though the positives in this set are too significant to be outweighed by these complaints, and complemented by other recordings I have no doubt that Kempff's mono set will find a happy home on many shelves. The sound of these late mono recordings is clear and intimate, if somewhat flat due to its vintage. I prefer it to the brittle sound of Kempff's stereo set recorded a decade later. Furthermore, to my ears the playing in the mono set is more vital and virtuosic. There are a few areas with recording artifacts if you listen very carefully, but I won't point them out lest they detract from your experience. The box set is nicely assembled with liner notes and individually labeled sleeves for the CDs. It always sounds like he's improvising; and nothing "channels" Beethoven more than that. but these performances are primordially created, as if the notated-music has been thrown away and Beethoven is improvising NOW. Your tastes may differ, of course, but if you want a quintessential poetic approach, fresh as a present stream..."dis be da one." Not only is the piano sound on this earlier Kempff set more satisfying than the later stereo recordings, which made me feel like I was listening from the last row in a big room, it's more consistently more satisfying than DG's erratic recent Pollini compilation. Apparent some knowledge has been lost in the past half century! The performances are thoughtful, soulful, playful and insightful. Kempff's playing is skillful but never calls attention more to himself than the music itself. Definitely a keeper. 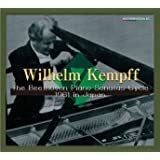 5つ星のうち5.0Kempff deserves the accolade as the greatest piano interpreter of Beethoven. 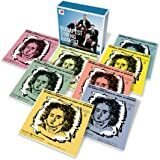 These have been considered by the grammaphone to be his greatest set of Piano Sonatas recorded. The amazing thing that occurs here is that one can appreciate almost every individual piano stroke. This makes the music stand out in comparison to others. Beethoven is clearly shown to have been the ultimate composer of the Classical Era. One of the great cycles. Of the hundred or so available recorded cycles (out of about one hundred and fifteen or so), this rates as one of the best. 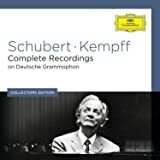 In better sound than either the DG stereo cycle and the live King International cycle, Kempff's style is more poetic and less intense and fiery than others. Whatever Kempff may give away in terms of speed, power, and precision, he makes up for in other ways. Eminently satisfying.